Started out the day with a cup of spicey Xian Dou Jiang (咸豆浆). 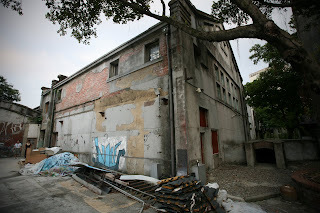 Then some exploration into local Taipei urban decay of an old brewery. It's now called the Huashan 1914 creative park. On Weekends they have mini K-cars parked there serving small snacks. During the evening it's a good place to pick up a leaded drink. Then finished the day off at a nice Japanese restaurant. 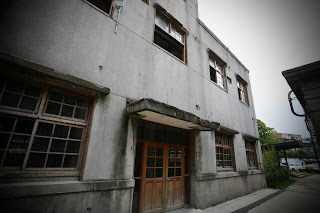 It was a cool place. Live band suspended above the bar. The place used to be an old theatre. 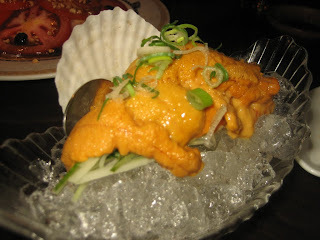 They had a boat of Uni pile don Uni, my favorite! and only $11, I love Taiwan! Nice pictures, I can't wait to visit! What lens are you using? The photography district sells the 16-35 2.8L for $1000 brand new. It's a $1500 lens in the states. Yum! Boatload of fresh uni! I'm jealous!